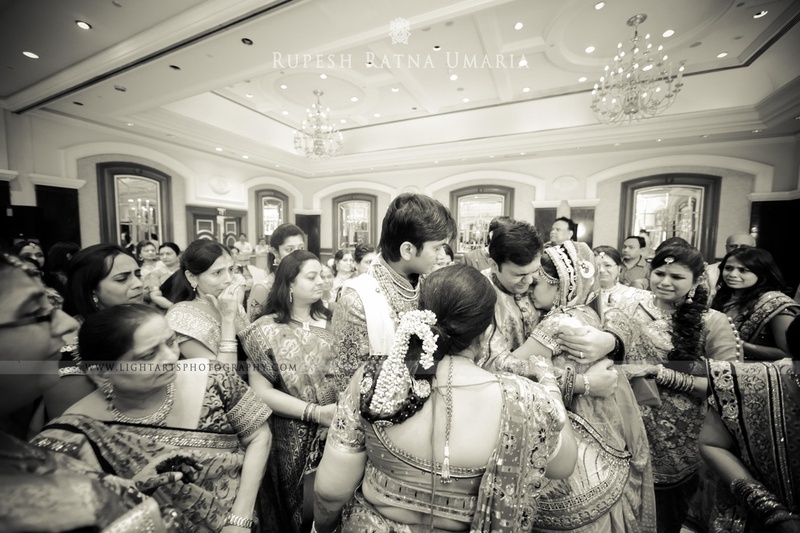 Karishma and Karan’s wedding celebrations were as sweet as the sound of their alliterative names. 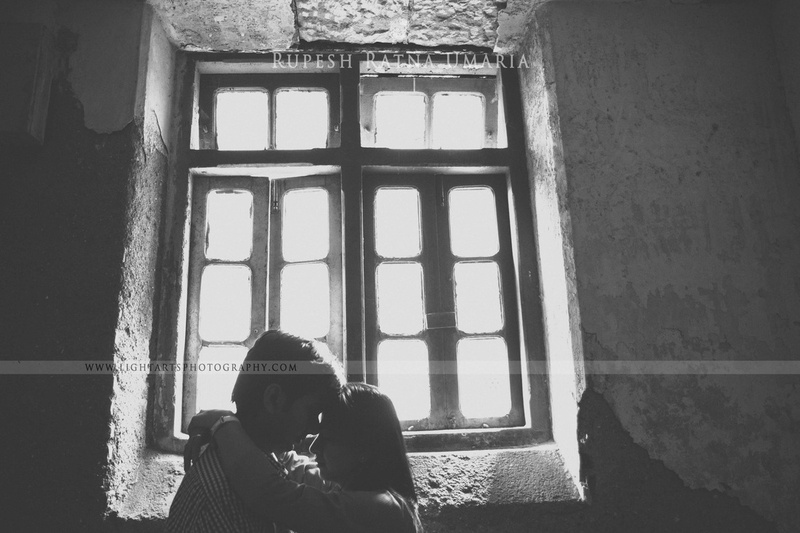 Their rustic pre-wedding photoshoot and traditional marriage ceremony left us aww-ing from start to end. 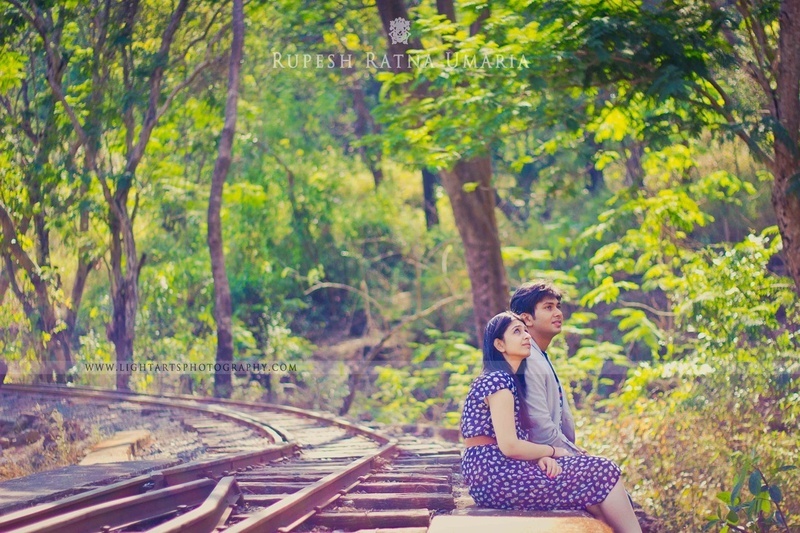 The pre-wedding shoot was set in the backdrop of abandoned old spaces and rusted railway tracks amidst lush green trees. 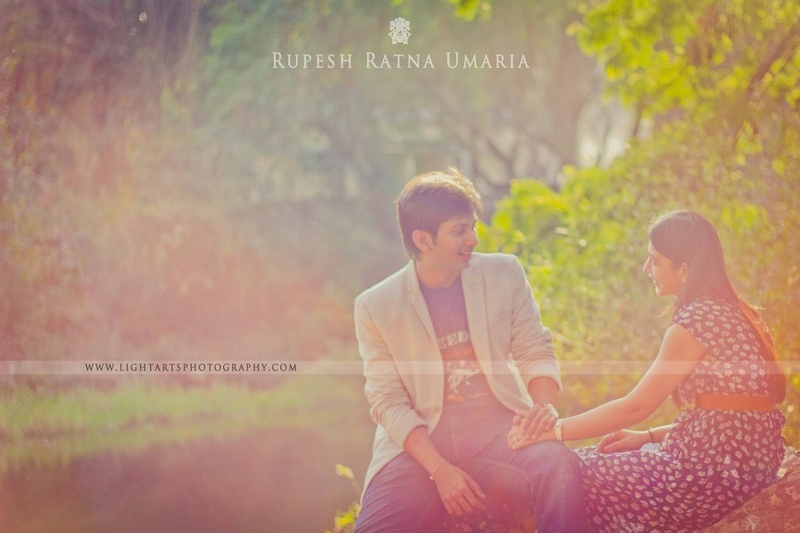 The attire they picked blended well with the entire natural environment. 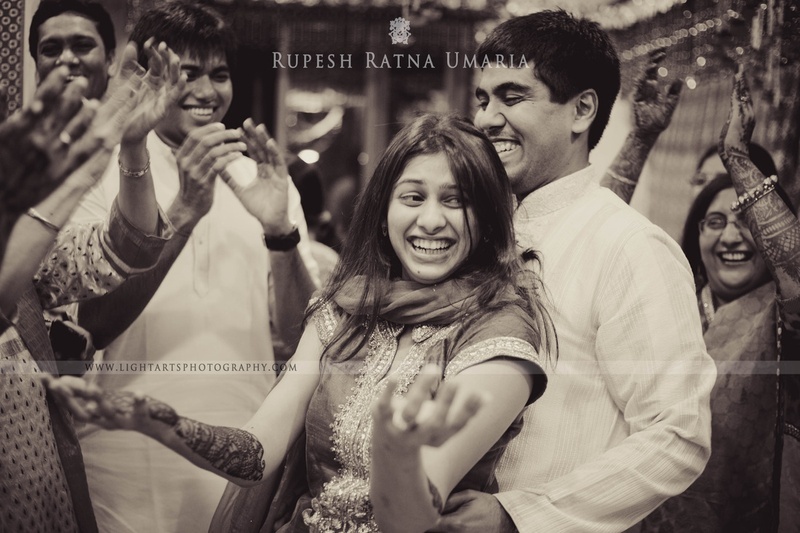 Karishma wore a navy-blue, daisy-printed dress while Karan kept it semi-formal in his sky-blue blazer, matching t-shirt and denims. 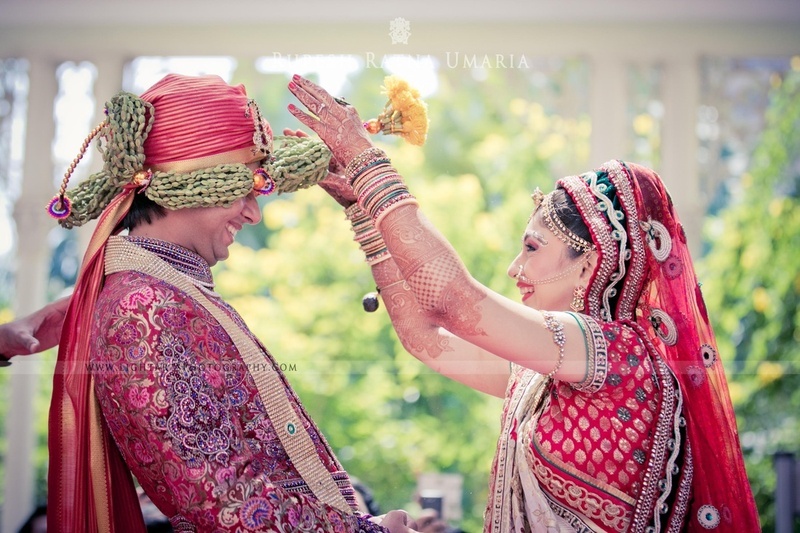 Wedding celebrations began at the fun-filled Sangeet ceremony for which this beautiful couple was dressed in color-coordinated outfits. 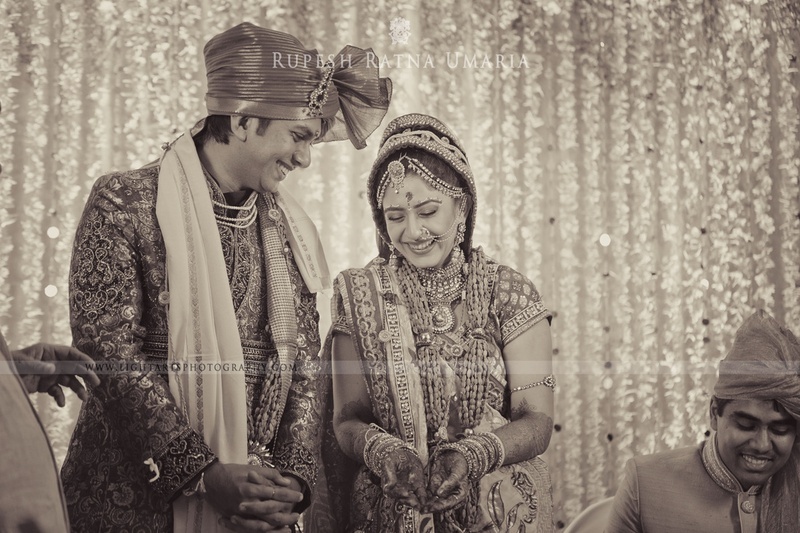 Karan donned a classy navy-blue velvet sherwani with gold embroidery details; Karishma’s outfit too was a mix-matched lehenga in the same hues. 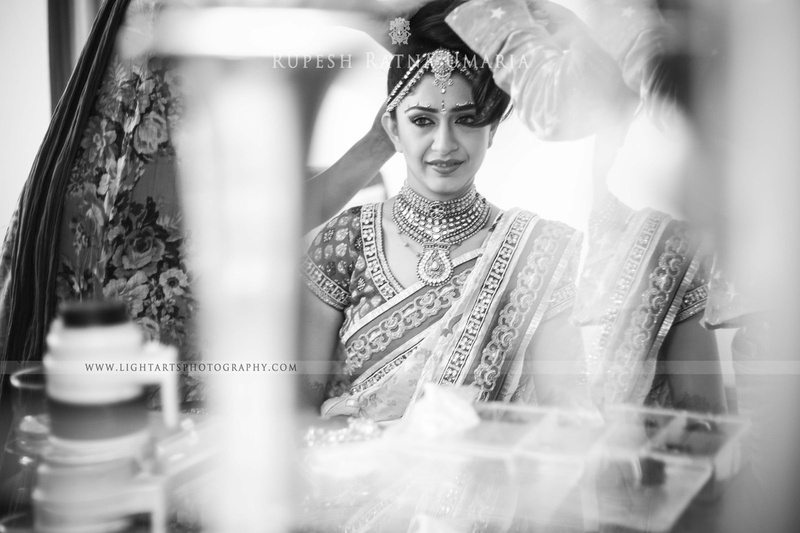 She accessorised her look with dainty jewellery that included earrings and a necklace – together these two looked absolutely ravishing. 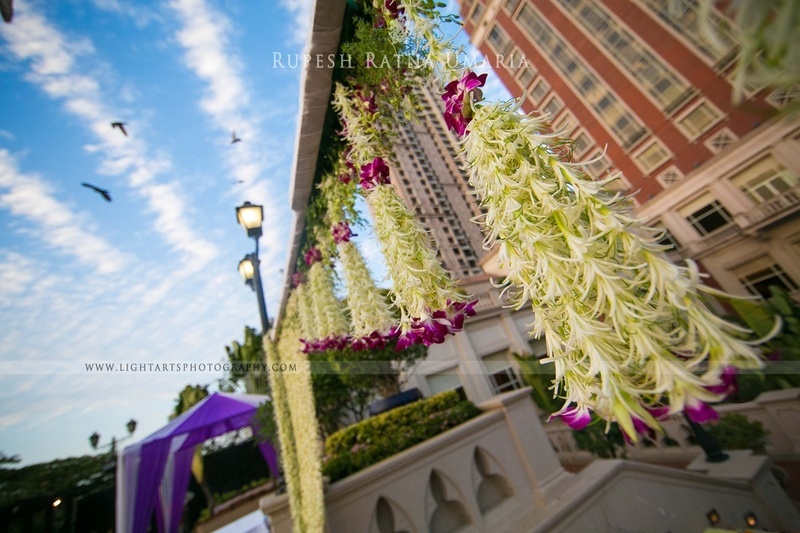 Their Saat Pheras were held at the magnificent ITC Grand Central, Parel. 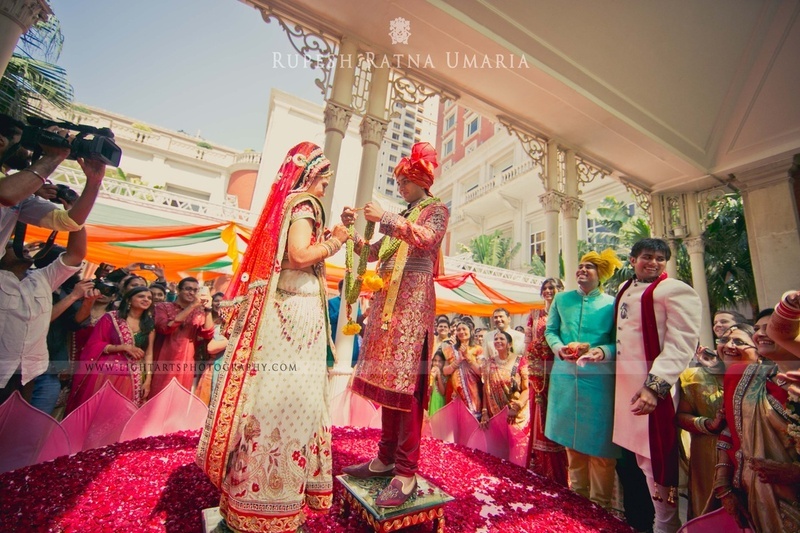 The Varmala ceremony was held under the dome structure with an elevated stage, which was decorated to look like a bright pink lotus. 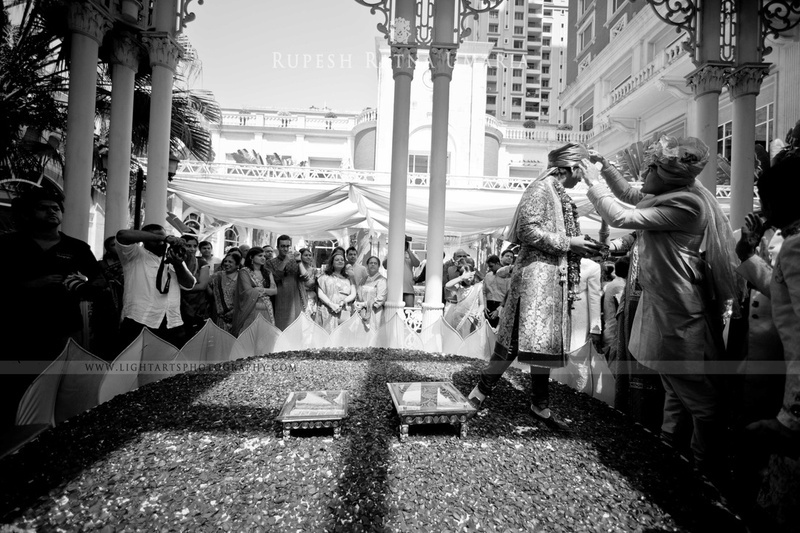 The stage had a bed of flowers with an abundance of red rose petals showered all around. 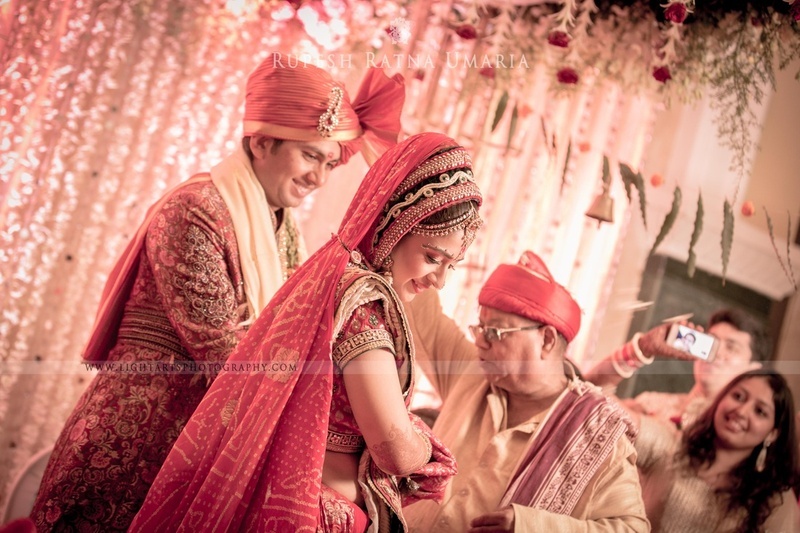 The beautiful bride wore a traditional red and white Panetar saree, which was intricately embroidered along the border. 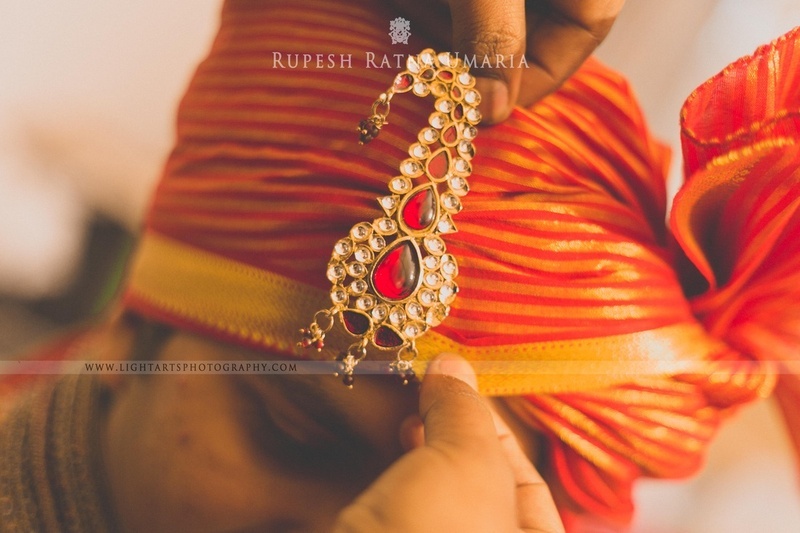 Her multi-layered necklaces and a borla-styled, two-strand maathapatti made her look like the quintessential Gujrati bride. 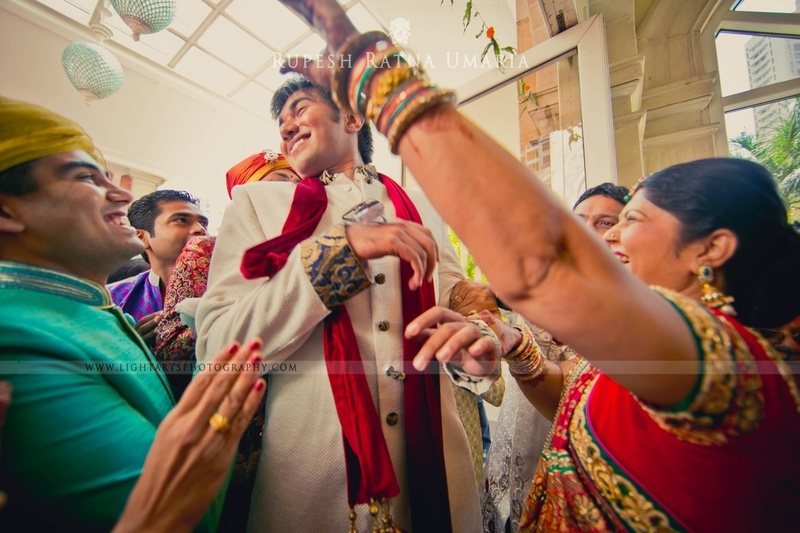 The handsome groom, Karan looked dapper in his red brocade sherwani that was embellished with beadwork and sequins. 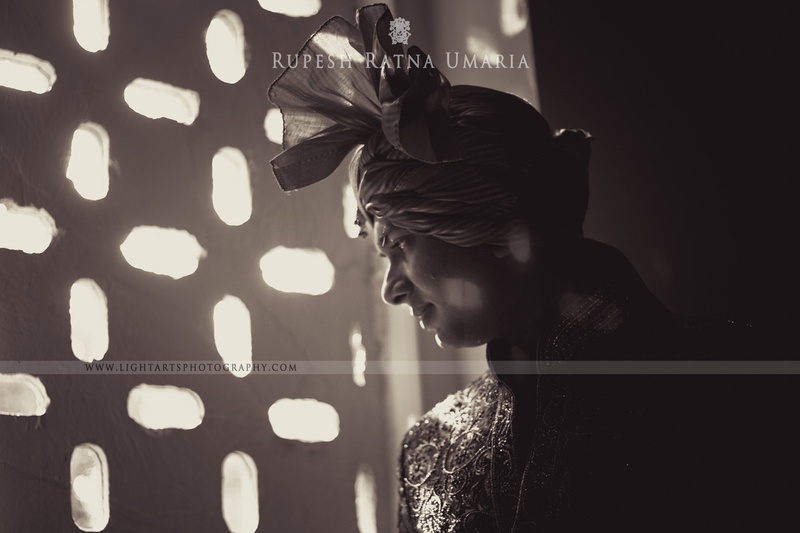 His striped orange and gold organza safa complemented his entire ensemble impeccably. 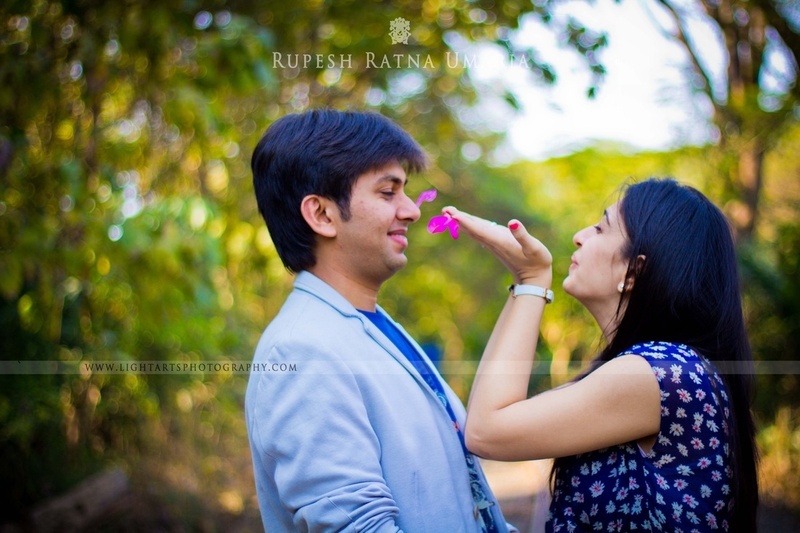 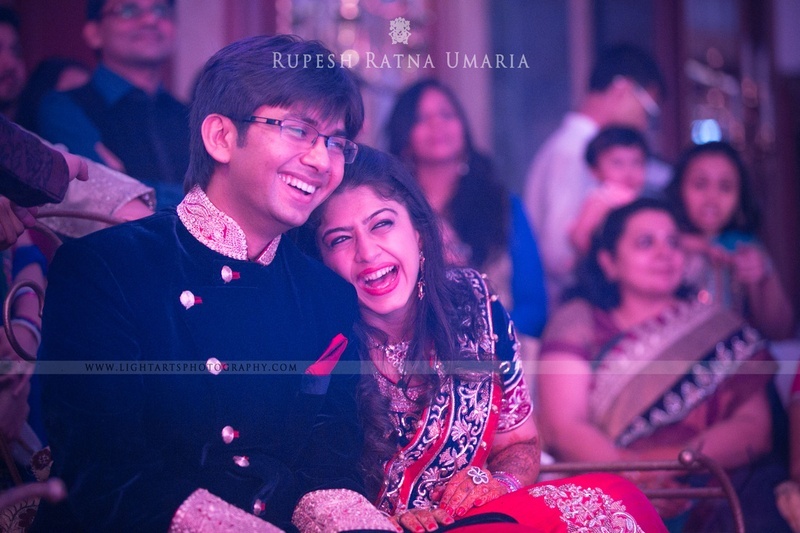 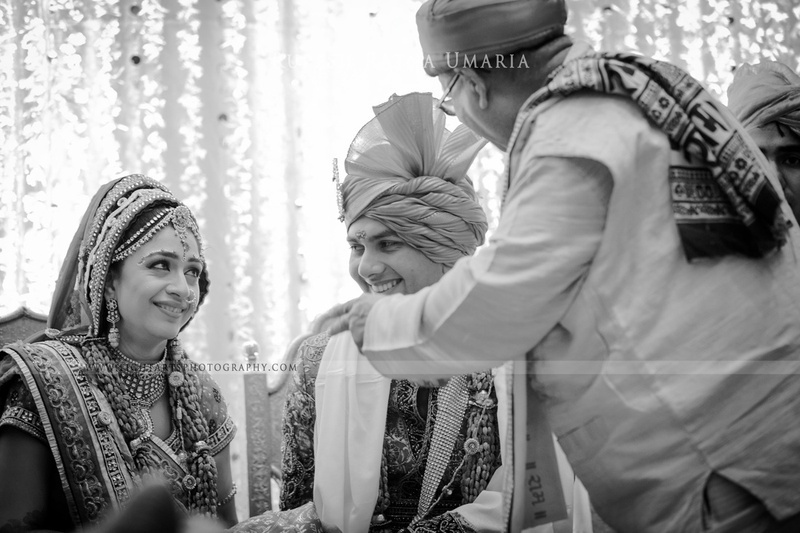 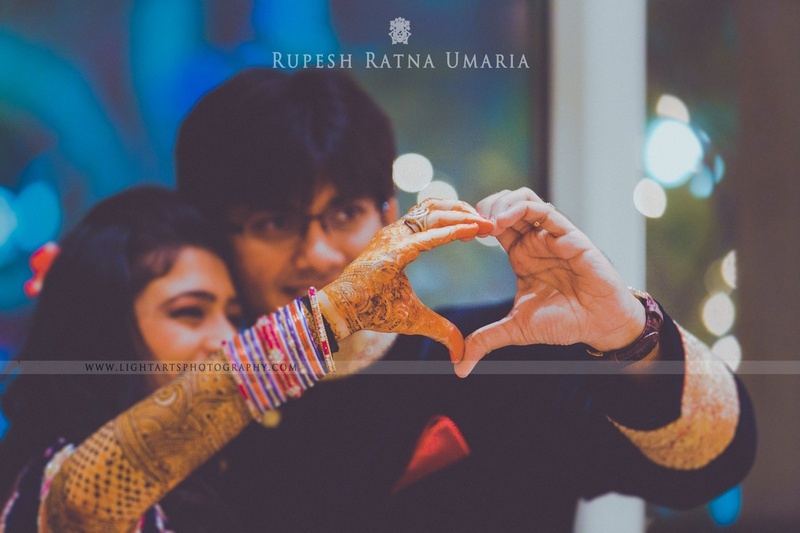 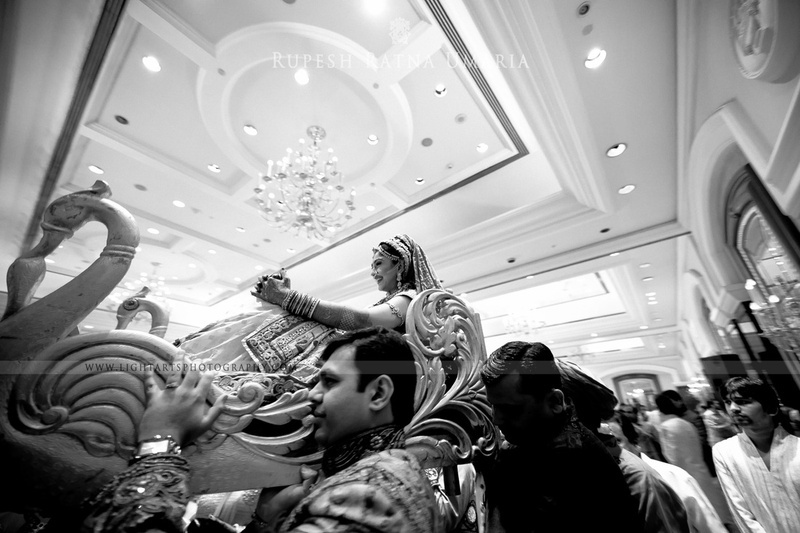 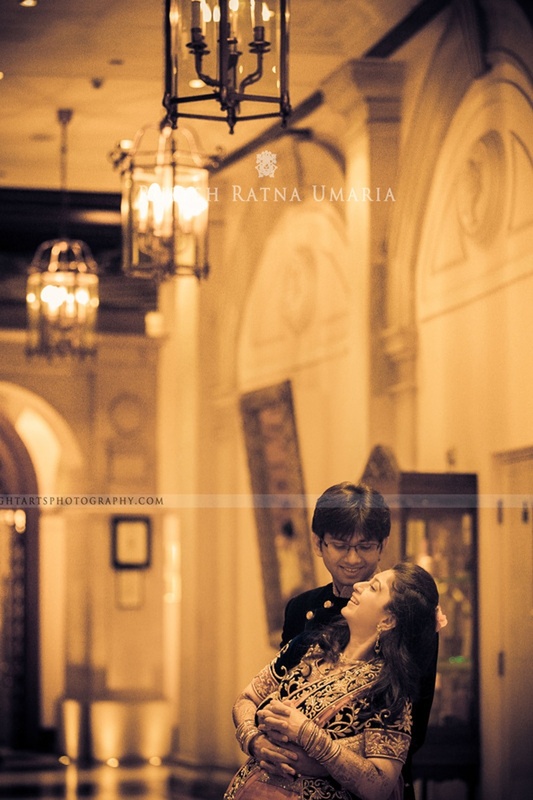 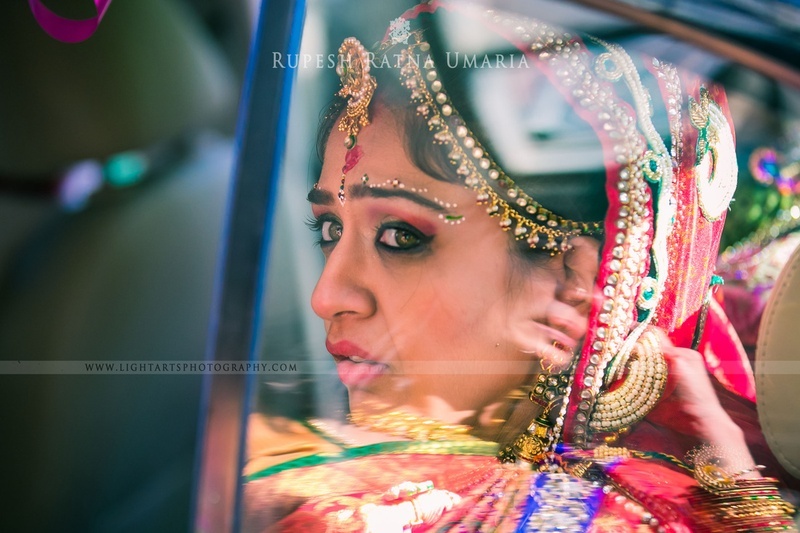 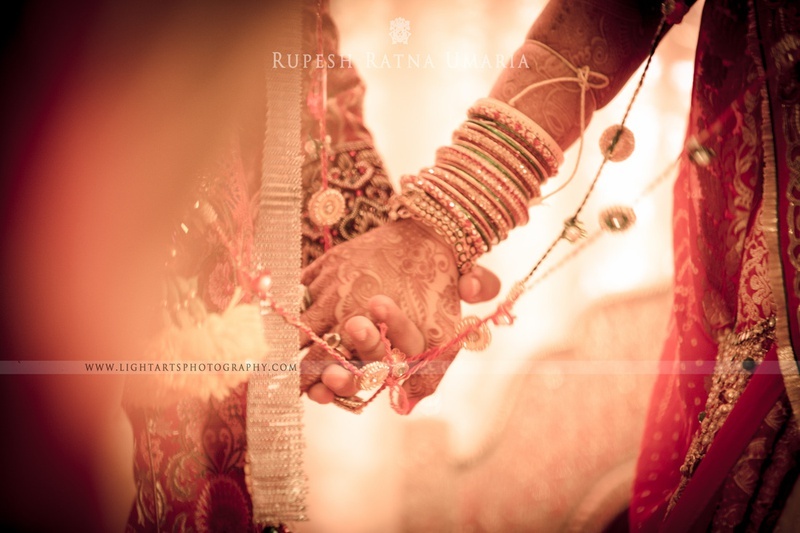 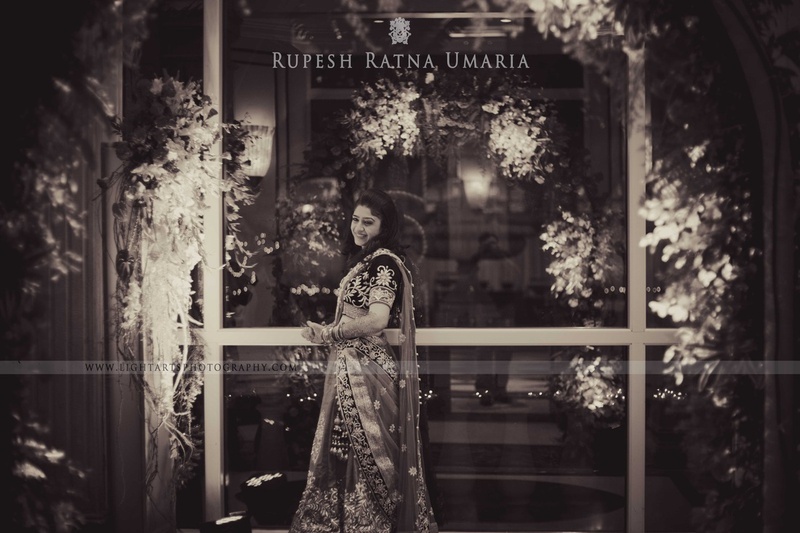 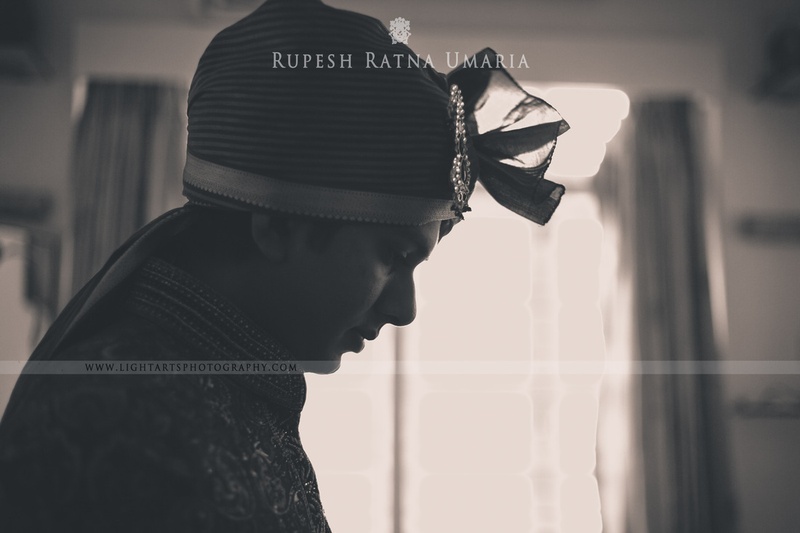 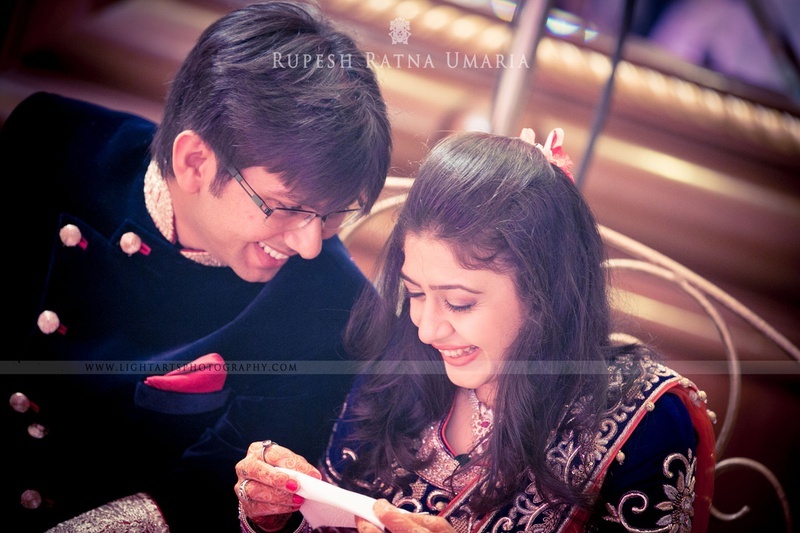 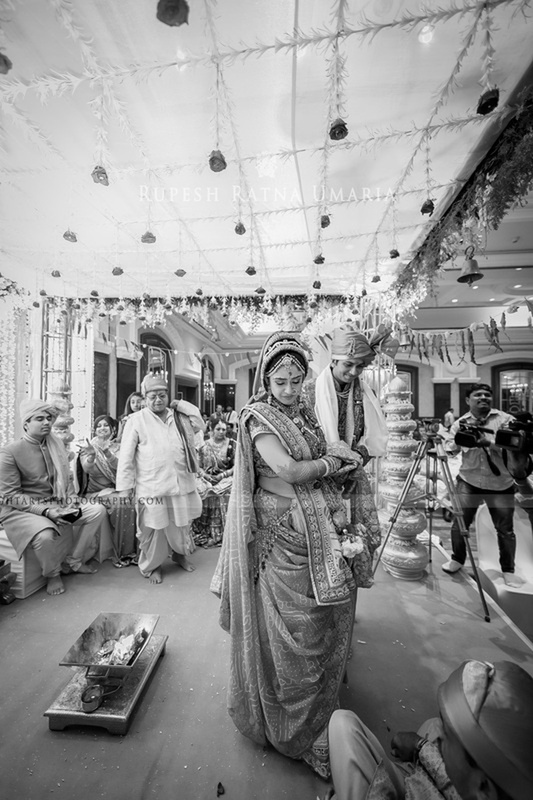 Rupesh Ratna Umaria and his team from Light Arts Photography captured every minute detail of this beautiful union with utmost skill and precision – whether it was the romantic pre-wedding pictures or the bittersweet goodbyes at the vidaai ceremony.